To understand why I love Facebook, I need to take you back to an earlier time. It was the Fall of 1993, and I was trying hard to find my entry point into Silicon Valley, straight out of business school and with only a summer job at Tandem as relevant experience. I managed to get a consulting gig that involved doing some competitive analysis for Apple, who was at the time considering entering into the “online service” market that was led by America Online. I got paid to spend a bunch of time comparing the feature sets, strengths, and weaknesses of the then market leader versus Compuserve and Prodigy, with hopes that I could help Apple figure out the right way to jump in*. Less than a year later, in the summer of 1994, working at what was then the hottest company in the Valley, Silicon Graphics, I found myself in the perfect position to spot the Web as the most significant market opportunity and change agent since the personal computer. I was the product manager for the Indy workstation, the platform on which Marc Andreessen and the team at NCSA wrote the original Mosaic browser. Indy was also the server used to launch the first Web-native publication, HotWired (giving rise to the first website sponsorship deal). Indy was also the primary development platform at the company that Marc and Jim Clark (the then recently-departed founder of Silicon Graphics) had just formed, which would get renamed “Netscape”. And it was the platform that they used to build out the original server farm that changed the world of software by making the browser available for download — for free! So I became an “intrapreneur” and launched the WebFORCE business in January 1995, introducing the industry’s first turnkey web server and the first WYSIWYG HTML editor. How was I able to spot the huge market opporunity represented by the emergence of an open Web? One simple reason; I had seen the future behind the walls of the first online services. And I could spot the trendline early of the virtuous cycle of growth enabled by a free web browser built around the open standards of the Internet and the Web. A rapidly growing user base inspired a new crop of entrepreneurs to launch new sites, which attracted publicity and excitement, and got more people to come check out the Web. And what sort of sites emerged? 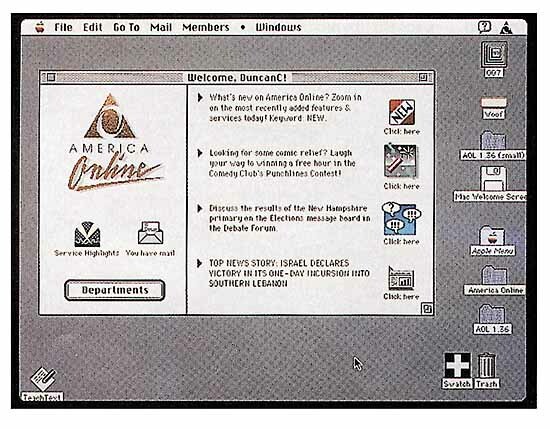 Everything that existed within America Online, Compuserve, and Prodigy. Jeff Bezos, for example, chose not to make a bookstore for any one of the online services. He created instead a bookstore for the Web, and watched it take off faster than any e-commerce experiment that preceded it. And that’s exactly what’s happening all over again today, and why I truly love Facebook. Mark Zuckerberg and team have built a really great experimental testbed that shows us what can happen when you mash up applications and the “social graph.” When you bring who-you-know to a web application, it gets turbocharged and transformed. It’s so exciting to watch Facebook’s innovation, from the News Feed, to the F8 platform play, and now to the bold (albeit controversial) Beacon initiative. But what happens as these ideas get turned into capabilities of the web itself, thanks to a combination of community efforts and commercial efforts like Google’s OpenSocial? Here’s my prediction: in 2008, we will see the true beginnings of the “Social Web,” as open and vibrant as when the first incarnation of the Web that emerged in 1994 and 1995. And, let me go out further. When we look back 15 years from now, the term “social network” will be as unfamiliar and difficult to explain as “online service” is today. Now, I don’t really expect you to believe me. (It’s so fashionable right now to declare that we are now in a Bubble, and than the coming year will be characterized by collapse.) I just wanted to put my prediction on the record. Let’s check back in at the end of 2008 and see whether I was right. *Apple did not figure out the right strategy. Just as the web was really taking off, they launched the ill-fated “Apple eWorld” proprietary online service, which was a miserable failure. Mind you, the rest of the post is awesome, I just had to drop a note that I remember those screens, and the old Macs and PCs – and X Windows.